Every time I wander down the baking aisle of the grocery store, I try to come up with a reason to buy toffee bits besides "I want to eat them straight from the bag in one sitting." So when I stumbled upon a recipe for oatmeal toffee cookies, I knew I had my reason. I followed this basic Hershey's recipe, added a third of a cup of toasted pecans, and sprinkled coarse sea salt on top. 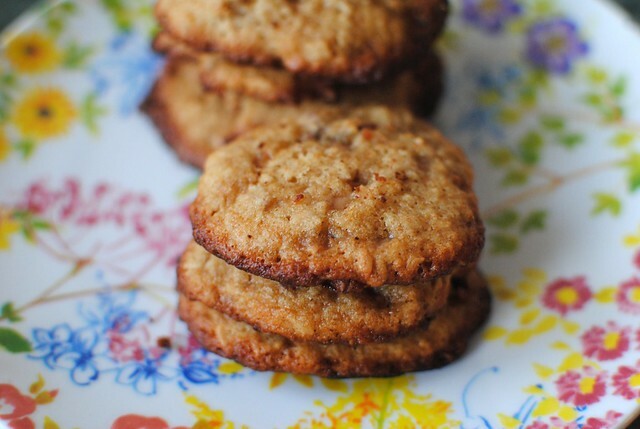 These cookies are nutty and buttery and all kinds of delicious. They aren't exactly the prettiest baked goods I've ever seen, but sometimes we have to make sacrifices for the things we love.